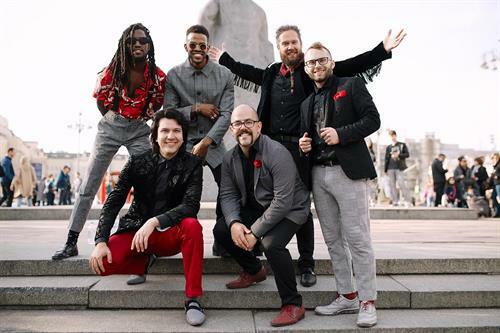 Six Appeal Vocal Band is one of the busiest touring a cappella ensembles in the country. From coast to coast, the group has become known for their vivid musical style, unmatched energy, and playful charm. Their far-reaching repertoire spans a multitude of decades and genres, including Pop, Country, Classic Rock, Jazz, R&B, and much more. The group began as a collegiate hobby in 2006 at Concordia College in Moorhead MN. Performing around campus was a great way to relax from classes, create a new sound on campus, and yes, meet girls. As they evolved into a professional ensemble in 2010, Six Appeal began to introduce new members, transforming their sound and focus into the current dynamic sextet. In 2012, they won the title of National Harmony Sweepstakes Championship, securing their place in the a cappella community. The appeal of these young men enables the group to perform anywhere from college campuses, to State Fairs, corporate functions, community festivals, theaters, K-12 classrooms, and has even brought them into the national spotlight, singing for The 2013 Allstate Sugar Bowl live on ESPN. With members formally instructed in singing and musical composition, and over 100 combined years of music and performance training and experience, Six Appeal utilizes a diverse arsenal of style and entertainment. In addition, Six Appeal has a passion for spreading their a cappella music to every audience, and an essential aspect of their mission is to empower young singers in their educational outreach program. Six Appeal is: Andrew Berkowitz, Michael Brookens, Reuben Hushagen, Evan Taylor Jones, Trenard Jones, and Jordan Roll. $15 adults, $6 students, k-pre free.